The Royal Tomb is located below the Temple of the Sun, and is one of the most important tombs in Machu Picchu. Formed by a small natural cave with an opening facing to the east, the interior of the Royal Tomb is made up of finely carved stones, niches and lithic pegs. The main feature of the tomb is a large altar with 2 levels and a symbolic stair case carved insitu in the natural rock. Due to the fine stone carvings (the immaculate wall to the right of the entrance which seamlessly follows the curvature of the staircase is simply sublime) and the location of the tomb within the Urban Sector of Machu Picchu, historians deduce that the Royal Tomb was used uniquely for hierarchical mummies that belonged to Machu Picchu. Although the term tomb suggests a closed dark burial chamber, the tomb was actually open to light, specifically in the mornings, when the sunrise illuminated the entire tomb. The tomb could have been considered more like a chapel, a place of worship, and less like the closed tombs that were found elsewhere within the citadel. When Machu Picchu was abandoned by the Incas, all important ornaments and mummies were taken for safe keeping. 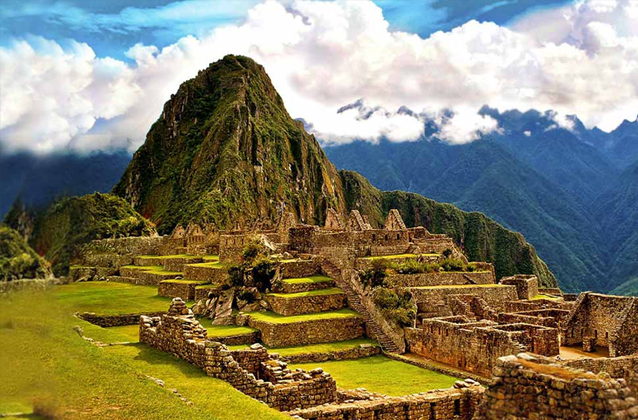 When Hiram Bingham arrived at Machu Picchu in 1911, the Royal Tomb was found to be empty. Later archaeological digs revealed little more.